Stroke can often open up a whole new world when it comes to vocabulary. Well, you know what, that’s okay because he “gets it.” It’s exercising a part of his brain that the rest of the world often lets go dormant. It’s actually creative. And by golly, a buffet is a place that’s all ready and you pay for it! • Words may literally take on a whole new meaning after stroke. • Clichés may be lost in translation in a post-stroke brain. • Look for signs of puzzlement or confusion and take time to explain. Listen to your survivor. You may learn a new vocabulary word or a description that you have always taken for granted. Our staff and volunteers take fun seriously! Planning for the 2016 Stroke Camp season started last year as our crew got together to work on the theme, discussion group topics, entertainment, crafts and much more. 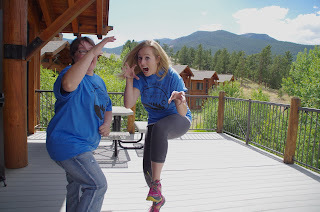 Now, I'm not going to reveal right now what we're doing for 2016, but I thought you'd enjoy this glimpse into what went into our planning for last year's theme of our around the world with Stroke Camp. We are a close-knit group that thrives on fun and working together to create the best experience for our stroke survivors, caregivers and volunteers. We tried out costumes for skits and group activities and had many laughs in the process. We also experimented "on" some of our local stroke survivors who are members of the Chime Strokers to try the "me books" concept last year, which was very successful. It was an opportunity for us to gauge the interest, comfort level and how much time it took to complete the project. As you can tell, we love what we do because we love our survivors and caregivers. We love even more what we get in return: the smiles, the laughter, the friendship and THE love! Can't wait for the new season to start!! One of the best parts of being involved in Retreat & Refresh Stroke Camp is witnessing everyone being themselves. Camp is the place where you can "let go" and "let your guard down" and laugh and be silly and simply be HUMAN. 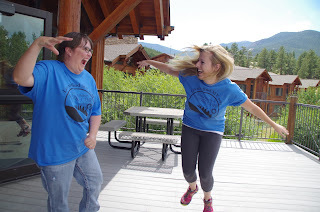 At our August 2015 camp in Colorado sponsored by Cheyenne Regional Medical Center, I was enjoying the beauty of the mountains and suddenly had a front row seat to watch the comic antics of stroke survivor Stacy Gupton, left, and music therapist Catie Alpeter. Those two are the queens of clowning around at Stroke Camp, and they outdid themselves this year. What was most beautiful to witness was how these two young friends played and laughed. And nothing was stopping Stacy, who has limited use of her left side from the stroke, from accepting any challenge Catie issued. One of the many joys of Retreat & Refresh Stroke Camp is the rediscovery of the simplest pleasures in life … which we often take for granted. Just waiting for those moments to happen is what makes me love everything about the Stroke Camp experience. I'm extremely blessed to have the opportunity to photograph so many of these special memories, and here are just a few of these occasions from the 2015 camp season. I loved watching Lauren Kramer, our director of operations, inviting one of our survivors to get up and dance at our Montana camp during the Saturday night entertainment. As many of the couples started to hit the floor, some of our staff and volunteers were looking for "singles" who might like the chance to dance. Lauren asked Irene, who is always up for some fun. And it was so inspiring to witness Irene forget all about any physical challenges and simply move to the music. 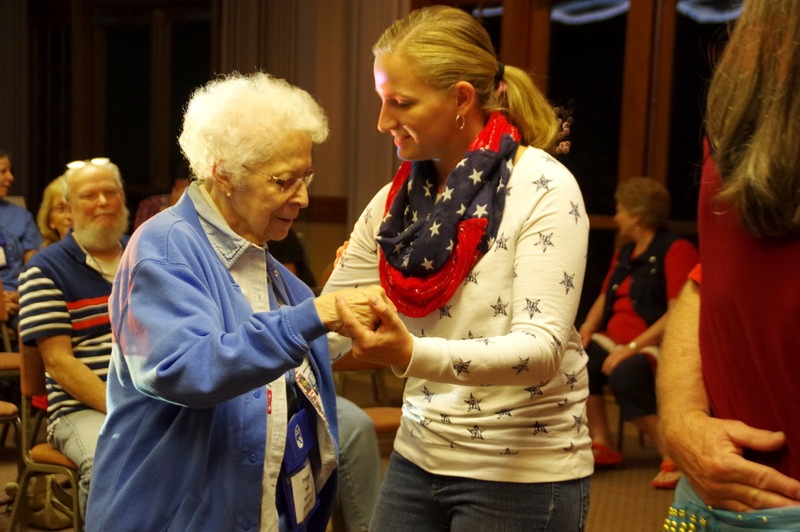 One of the greatest lessons I've learned about being involved with Stroke Camp is how important it is to just "ask" … ask a survivor or caregiver if they want to dance or sing or play or be part of the group. If we'd all ask someone if they'd like to participate, so many walls and fears would be erased in this world. Don't just wonder if someone wants to do something, ask them. Sometimes that's all they need to hear to join the fun, to be invited, to be included. Just ask. 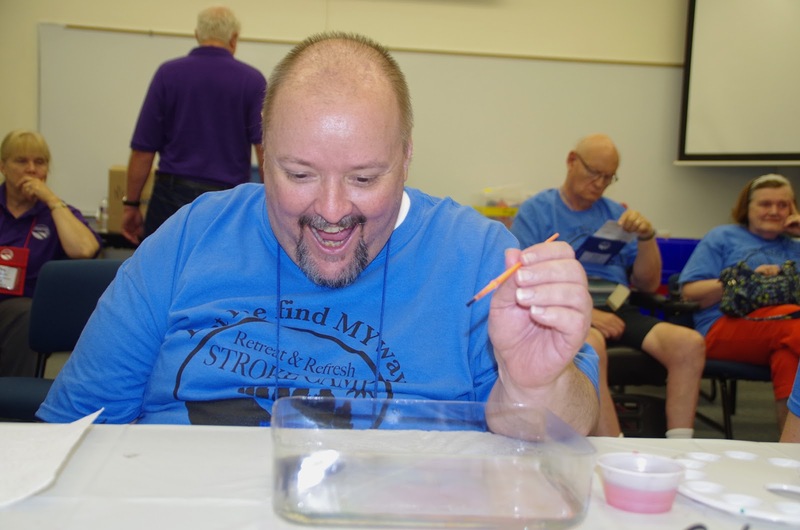 Stroke Camp is also all about encouraging our survivors and caregivers to express themselves creatively, and they don't have to be artists to create something truly amazing. One of our crafts last year was a form of Japanese painting, a unique technique of applying small drops of paint to a special water base and watching them spread into beautiful images. I watched a lot of campers try this art form for the first time, but I was particularly drawn to Wayne at our Chicago-area camp and watching his priceless expression as he discovered that he could create art all by himself. His face tells the story of the wonder of what the human mind and body can create when given an opportunity and canvas to dabble and design. Yes, you have a creative bone in your body, whether you think so or not, and that "talent" is different in everyone. We just need the right forum to express it, and Stroke Camp is one of the most creative environments in the world because our campers are encouraged to be themselves.